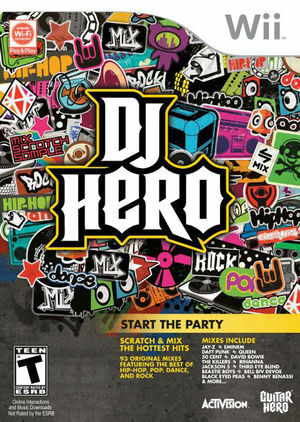 DJ Hero is a music video game, developed by FreeStyleGames and published by Activision as a rhythm game spin-off of the Guitar Hero franchise. It was released on October 27, 2009 in North America and on October 29, 2009 in Europe. The game is based on turntablism, the act of creating a new musical work from one or more previously recorded songs using record players and sound effect generators, and features 94 remixes of two different songs from a selection of over 100 different songs across numerous genres. This title relies upon a special turntable controller. The following controller config can help simulate this controller on a XBox 360, or similar, controller. The graph below charts the compatibility with DJ Hero since Dolphin's 2.0 release, listing revisions only where a compatibility change occurred. 3.0-438 Windows 7 AMD Athlon II X3 450 @ 3.2GHz AMD Radeon HD 6670 D3D9 low graphic config: Buggy videos. Good audio. Some graphic errors. 75% FPS on menu. D3D11: Perfect video playing without slowdowns. 85% FPS on menu. 76% playing. This page was last edited on 22 February 2018, at 23:46.